Bitcoin and many other cryptocurrencies have staged an impressive move upward over the last months. More and more new ‘investors’ have stepped in the cryptocurrency space and are propelling the currency or ‘crypto asset’, as some like to call it, to almost $3000 dollar. In South Korea, exchanges are already showing the 4000 dollar mark. Is this a bubble ready to burst or a new technology taking off? It’s very hard to tell. The underlying technology, blockchains (based on Merkle trees), holds value for lots of reasons. The million dollar question is which blockchain will be widely adopted by businesses and consumers. The original cryptocurrency, bitcoin, can be mostly described as a store of value and means of transaction. But companies have also started building other applications on the original Bitcoin blockchain. 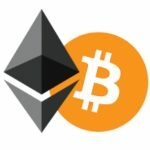 The little brother, Ethereum, focusses on smart contracts. In essence it’s one gigantic decentralized computer. Some call Ethereum more of a commodity while Bitcoin is more of an asset. What bitcoin is to gold, might be what ethereum is to oil. This is not investment advice in any way, but for those willing to ‘place a bet’, I will share with you how to buy these cryptocurrencies in an easy and quick way. As with all investments, don’t put in anything more than you are willing to lose! These assets are simply bits on the internet, there is no company or cash flow behind it. It’s very likely that the price will drop to 0, but it could also keep on rising to 3000, 5000, 10000 or 100000. Some even value bitcoin being worth 5 million in 2026, notably the founder of The Pirate Bay and the Pirate Party in Sweden, Rick Falkvinge. Cryptocurrencies are complex. That’s why I will leave a link below with videos explaining more about it. I have selected the most straightforward and useful videos for you to discover what this hype is all about. Ethereum has seen 86 big corporations joining their Enterprise Ethereum Alliance, hinting to adoption by the corporate world. Deloitte, Rabobank, Infosys, Merck, Mitsubishi UFJ Financial Group, National Bank of Canada, State Street, San Fransisco Stock Exchange, Toyota Research Institute, and many more.. The market cap of the top three players is now 74 billion which is about half the size of IBM or Cisco. 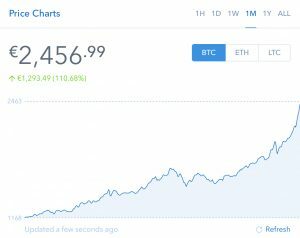 Bitcoin has soared 110% in one month, adding more than 1200 EUR per token. 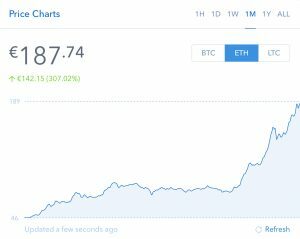 Ethereum increased with 300%, adding 142 EUR per token. Again, this is at your own risk. Nobody can truly value these new technologies. Some say it’s a big bubble, and bitcoins will be worth nothing in the short future. Others say, it will remain very volatile, but will stabilize at a value much higher than today. Some estimate bitcoins to worth 5 million a piece in a very distant future (if everything goes right). To be honest: nobody knows. If you want to purchase these cryptocurrencies, you have multiple ways of doing so. It takes about 5 minutes to get it all work and you’re all set! If you would like to purchase larger amounts of bitcoins, it’s advised to use big exchange such as Kraken or Poloniex. Some experts also advise storing larger amounts of Bitcoin on ‘offline wallets’.